Joyride - The Charity Ride for the Children's Hospital, organised by Corrado, on Easter Friday morning, was a great success. 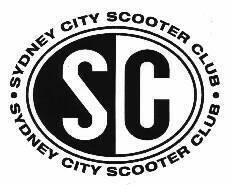 Around 30 scooters turned out to support the cause and around $1000 was raised. Well done Corrado!!! Easter National - The first National organised by the SCSC and with only 8 weeks to pull the thing together and let everyone know, the result was pretty good. A weekend full of activities starting with a Thai banquette and then the next day 20+ scooters hit the road from the Scooter Centre sausage sizzle for the 120+Km trip to Katoomba. Once in the Blue Mountains much beer, dancing and scooter entertainment was had including dirt trekking, videos, garage sale and lively conversations (honk, honk). A great weekend thanks to the efforts of many people. Thanks should go to Chris Tiffany from Maxwell Optical for donating a camera and Phil Eriksson for donating alcohol. These were raffled off and the proceeds not only subsidized the event but gave us funds to continue running the club without the need for ongoing fees. Maynard was the happy winner of the camera and Garth (and anyone who carried on drinking with him after the bar shut) was the happy winner of the alcohol. Thanks also should go to Wally for the sound equipment and for being a DJ along with Alex, Maria, Steve, Dave, Leanne, Tony and anyone else that had a go. Tony should also be thanks for taking us on the Sunday nature trek and Craig for providing the video projector, which was much enjoyed by everyone on the Sunday night. Also to be noted Laura for the brilliant graphics, Emma for the brilliant printing and Sean for tracking down the hotel. The next meeting Wednesday 3rd - back by popular demand, the evening ride to Harry's Café on wheels. For those that fancy a mid week ride, turn up at 7:30 and we'll leave for a ride to Wooloomooloo. After a snack it'll be back to the Duke for a bit of the usual. Fred's Place, Queen's Birthday - An old favourite, Fred's place is a 50-acre farm in Colo Heights which grows micro cars, Hillman Hunters and scooters. Air out your tents for a campout complete with bon fire and scary animal stories. More info in the next newsletter.